Seriously, Why Wouldn't You Get a Robotic Vacuum For $100? 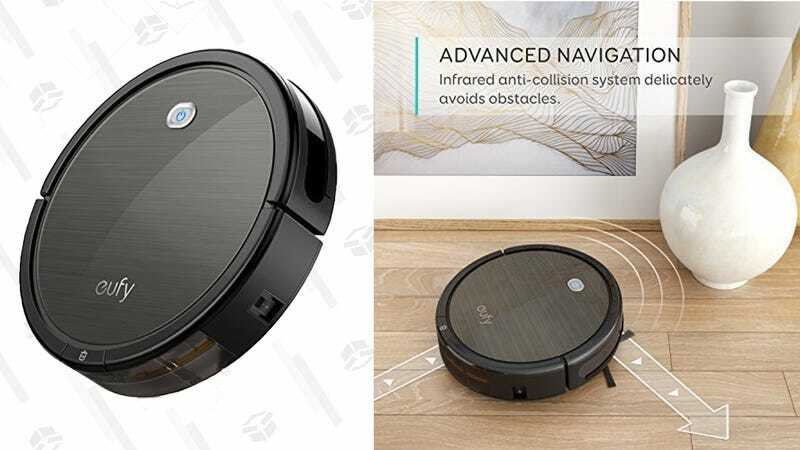 A bestselling, top-rated, and audience-favorite robotic vacuum is marked down to just $100 right now as a refurb, easily one of the best robotic vacuum deals we’ve seen. The Eufy RoboVac 11+ It has the features you guys loved about the original RoboVac 11, including a remote control, a slim body to reach under furniture, and a large dust box, but boasts upgraded suction power, so the vacuum will sense when it needs to use a little extra juice to take care of a mess. It also has slightly larger wheels to easier navigate over door jams and higher-pile carpets, plus a larger HEPA-style filter to better trap allergens and pet hair. The deal is only available today, but at this price though, I wouldn’t be surprised to see it sell out even earlier.